Watching TV or movies at home is probably one of my favorite past times. I wouldn’t mind being stuck in the house as long as there is something I could watch. Good thing my husband is the same. We spend most of our weekends at home watching together with our little one. So it would be ideal if we can have our very own home theater. But I always thought that having one will be very expensive. All that changed when I came across the discount home theater seating at Stargate Cinema. 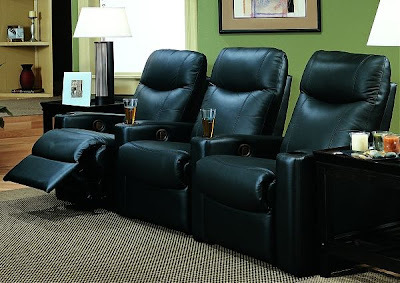 This set of 3 motion recliners costs only a little more than a thousand dollars plus free shipping. That is affordable in my opinion because the recliner I got my husband a few years ago was about $800…and it’s only 1 recliner. This is a set of 3 which will be perfect for the 3 of us. I may just convince my husband to start thinking about a home theater for our new home. Yeah!